Haunted hostelries are a recurring theme in paranormal lore, their eerie environments often inspiring the works of famous novelists. Cornwall's famous Jamaica Inn inspired the Daphne du Maurier novel of the same name, whilst across the Atlantic, the Stanley Hotel, located in the Rocky Mountains, served as inspiration for Stephen King's 'The Shining'. The UK seems especially blessed, or cursed, depending on how you look at it, with tales of haunted hostelries, and one of the most notorious of these can be found close to the Welsh-English border, in south east Wales. The ancient Skirrid Inn lies at the foot of the Skirrid Mountain, in the small village of Llanfihangel Crucorney, just off the main road between Abergavenny and Hereford. The Skirrid is believed to be Wales's oldest pub, and is amongst some of the oldest in the UK. It is also reputed to be one of the UK's most haunted locations. According to historical records, the inn has been providing its patrons with hospitality, and no doubt, a few heart-stopping moments, since at least 1104 - the era of the Norman conquest - and possibly, even earlier. The inn has a fascinating history, and is said to have played host to many historical figures. In the early 1400's, Owain Glyndwr, Wales's most famous opponent of English rule, is believed to have spurred on his rebels at the inn's courtyard, and indeed, numerous English kings are also reputed to have stayed at the inn - but presumably not at the same time. Much of the inn's ancient construction remains. The building's exposed oak beams are said to have been fashioned from ancient ships' timbers, and many of its wooden window frames are considered to be of original construction, along with one of the inn's wooden doors. The Skirrid's dining room houses some authentic sixteenth century wooden panelling. 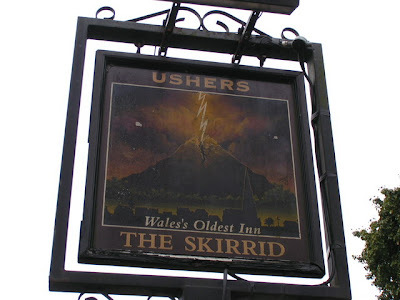 The Skirrid Inn has a fascinating, though very bloody history. Between the twelfth and seventeenth centuries, it served as a court room. During this era of British history, harsh sentences, including the death penalty, were meted out to murderers and petty criminals alike. More than 180 individuals are believed to have been executed by hanging at the Skirrid Inn, during its days as a courtroom. The inn's first floor is believed to have housed the courtroom, and a holding cell for prisoners was located half way up the stairs. The former cell is now a store room. In 1685, during an exceptionally bloody period in the inn's history, 180 insurgents from the Monmouth Rebellion were hanged at the Skirrid. The hangings were ordered by the notorious George Jeffreys, 1st Baron Jeffreys of Wem, more popularly known as 'Hanging' Judge Jeffreys. 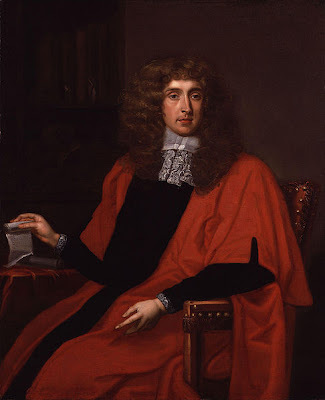 The Catholic King James II sent the judge to Wales to mete out harsh punishment to supporters of the Duke of Monmouth's failed Protestant rebellion. The rebels were executed by hanging from a beam beneath the Skirrid's staircase. The rope marks are said to be preserved in the wood of the beam. Many believe that the Skirrid's bloody history has left the inn with a whole host of non-paying guests, none of which show any signs of wanting to leave. Although there is no documentary evidence that he ever sat in person at the Skirrid's courtroom, Hanging Judge Jeffreys is rumoured to stalk the upper floors of the Skirrid Inn, no doubt looking for felons to condemn to death. One such felon, a sheep rustler named John Crowther, has reportedly put in many appearances throughout the inn. The malevolent presence of Judge Jeffreys' hangman has also been reported, along with those of several other hanged felons. Not all the Skirrid's reported spirits are criminal or malevolent in nature. They include a local clergyman, Father Henry Vaughn, whose presence has been reported as friendly and harmless. Fanny Price, who worked at the inn during the 18th century, is said to be very active throughout the Skirrid. It is believed Fanny died of consumption in 1873, aged just 35. She is reportedly most active in Room 3. Other ghostly occurrences include sightings of a spirit dubbed the White Lady, the sound of soldiers in the courtyard, the rustling of an unseen lady's dress, a powerful scent of perfume, and glasses flying off the bar unaided by human hands. An estimated ten to fifteen glasses are broken in this way every week. In fact, glasses began to fly around the bar as a former landlady, Heather Grant, negotiated a potential sale of the inn. Visitors, often totally unaware of the inn's haunted history, have reported a variety of disturbing phenomena. On more than one occasion, guests have complained of feeling as if they were being strangled, shortly before the appearance of welts on their necks, resembling rope burns. Other guests have become overwhelmed with dizziness, nausea or fear on the stairs, or complained of a palpable but invisible presence passing them at the same spot. In recent times, eight late night drinkers at the bar reportedly witnessed a bizarre phenomenon, flying money. Some paper notes, weighted down by coins, levitated and drifted around the whole bar. The notes allegedly hovered briefly in mid-air, before crashing to the floor. 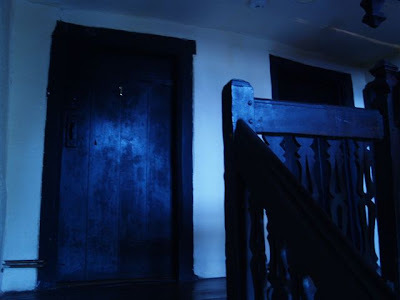 The inn also experiences peculiar knocking sounds, with doors either slamming shut spontaneously, or shaking violently before flying open unaided. Unexplained footsteps have been heard all over the Skirrid, and numerous cold spots felt, for which no logical cause has been found. 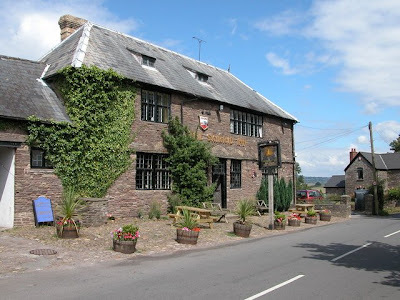 Are there rational, conventional explanations for the strange events experienced at the Skirrid Inn? Has the hostelry's bloody history somehow permanently imprinted itself on the building, to be spontaneously replayed over the years, by means and for reasons unknown? Sadly, these are questions none of us can answer with any certainty. All that can be said for sure, is that no-one has suffered serious or permanent injury at the ghostly hands of the spirits said to reside at the Skirrid. In fact, its ghostly residents seem to be one of the inn's biggest attractions. Excelent article Siani! really well written, im not glad that i read it before bedtime though lol. I do love this country, where we can have buildings with such rich histories like this one. Even if it were not haunted, a building that historic is bound to be spooky anyway. Sorry I can't offer any further assistance in relation to your query. I hope you're enjoying a pleasant stay at the Skirrid, with no ghostly interference :). Rhymney Breweries owned the Skirrid during the early 60s and I was a member of the Firms own Architects Department responsible for renovation works in progress circa 1963. Great article, I really enjoyed reading through it. We have recently posted the evidence video from our investigation at the Skirrid Inn - where we captured some pretty interesting activity. Take a look at the video at http://youtu.be/rTP1h6LtlE0 if you like or visit our website at www.realorotherside.co.uk for evidence from our other investigations as well. It's always great to receive feedback and see what other people think of the evidence we capture!!! ive been there. we were alone in it all night. i stayed in room 2 with my brother and my parents stayed in room 1. heard some footsteps going from the wardrobe to the bed and back in room 1. this happened all night. the chair next to the bed kept creaking like someone was in it. we got some photos of orbs in both rooms. no one was staying in room 3 and it was left unlocked so we went in and got some photos of orbs in there. we went downstairs at night and walked around in the dark taking photos. wasnt anything interesting in them. also did some evp but nothing interesting was on the recordings. moved the devils cup which is apparently haunted and u shouldnt move it but nothing happened. went to the graveyard in the dark to see the price graves but didnt see or photograph anything of interest. in one of the photos of the wardrobe in room 1 it looks like a face on the side and some people can see a whole woman sitting in a chair on the side. the bathroom in bedroom 2 used to be part of the cell. it was always ice cold in there. Us locals grew up hearing ghost stories of the angry spirit that overheard a new barmaid dismissing the notion of ghosts, only to find herself suddenly unable to breathe, a sensation of being choked over come her. Patrons that were in the bar bore witness to bright red welts and distinctive finger marks appear around her throat. The barmaid was sure to never to voice any doubts about the existence of the spirit again. Glasses have been known to move and launch themselves across the room and the footsteps of soldiers can be heard on the cobled court . On a more factual note, Owen Glandwr is said to have led his troops from here . The Inn dates back to the 1100's where it was a court , where it tried and hung criminals ranging from sheep rustlers to rapists and murderer's. 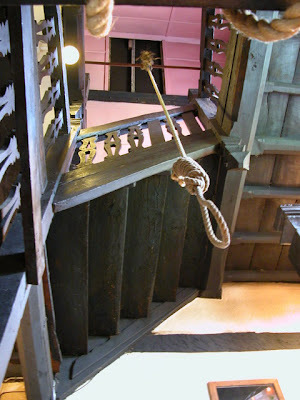 The original hanging beam can still be seen in the stairwell , baring the original rope marks of around 200 hangings that took place. It maintains plenty of original features, well worth a visit.